I love this digi set it screams homemaker, and so many options to make a card from it. It is one of many that you receive when donating to Help for Katie. I used the Cotton bobbin with the needle and the pin cussion to make my card, coloured with Copic Markers, teamed with Material Girl Cosmo Cricket papers, borders to the image using the Martha Stewart punch then tied with twill tape from the Craft Fairy a few buttons and pearl pins and a bit of love to bring it all together. see here for Digital stamps. Beautiful as always Jak...the paper goes so well. Your colouring is wonderful. What a beautiful card Jak, and yes I agree with you, this set is sooo perfect to make cards for fellow crafters and so many possibilities in it. And you have as usual made it look fantastic with your gorgeous coloring. Lovely card Jak - very homely! Colours are just right too. All the design elements of this card come together so perfectly, Jak! I've just been reading Katie's blog and what a source of strength that wonderful lady is! Gorgeous colouring Jak, love the background paper, it goes so well with the image! Fantastic card Jak and as usual the colours you pick are just perfect. Love it. 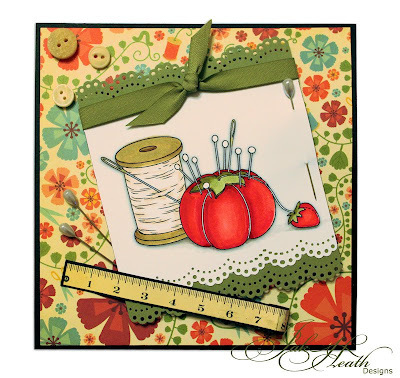 LOVE this card, and I have that Cosmo Circket paper, so guess what I will be making tonight:-) thanks for Sharing!!!!! Oops! I wanted to ask, how did you get the pincushion in front of the spool? was it a cut and glue on top, or was it (what I call) digital magic? thanks! !